Stefan Larsson. Spatial Bodies (2016); video still. Hundreds of feet above the earth, modular complexes of concrete, asphalt, steel, and glass balance improbably against a white, uncast sky, like a self-organizing cellular system in dynamic stasis. High-rise towers stretch, curl, and droop like placid fronds. Roads turn at their roots, rising like reeds suspended in sway. 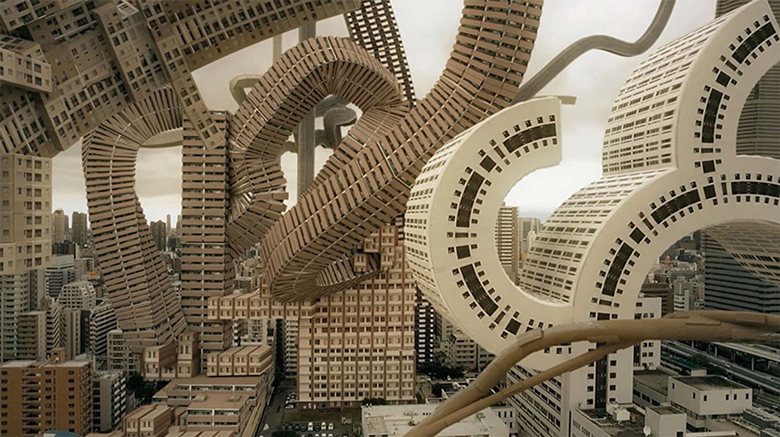 The city has evolved into a wild ecosystem regenerating upon its secreted skeletons. Down below, the familiar procession of automobiles is the only sign that human life as we know it may be preserved. 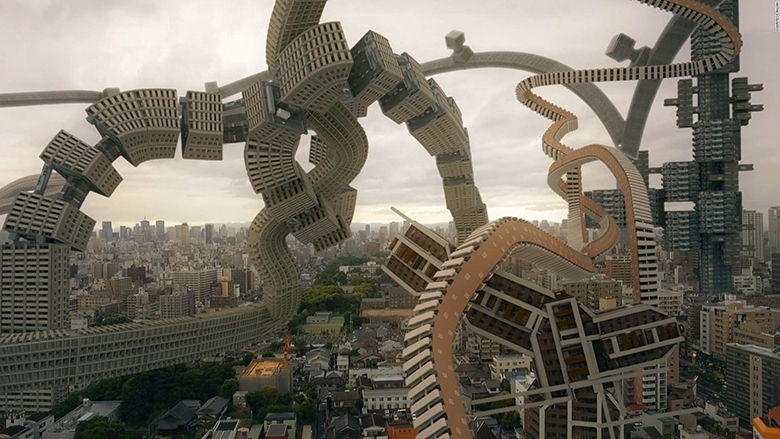 To make “Spatial Bodies,” Sweden-born, Kyoto-based artist Stefan Larsson used motion-tracking software and 3D meshes to manipulate drone footage of the Osaka skyline into a crystallized chaos of biomorphic architectural clusters. An inhuman lullaby by Japanese electronic artist Daisuke Tanabe carries viewers through this delicate network of sedimentations. The ambient melody is riddled with dreamlike glitches that blur the distinction between synthetic and non-synthetic elements. The light crunch of static absorbing the intermittent chimes of dropped coins assumes the texture of a deep lake subsuming the ripples of raindrops. High-pitched, overtly digitized notes waver in isolation, like viscous membranes thinning as they expand until the micro-rhythms calibrate with the whole. Far from the usual anxieties about unfettered capitalism and encroaching technology that we have come to expect from dystopic visions (think zombie apocalypse or nanobots replicating forever), these futuristic reconfigurations cast a primordial aura across the screen. The contrast is less jarring than disorienting, impressing us like the faint echoes of a dream one is just on the verge of remembering. Stefan Larsson. Spatial Bodies (2016); video still. Click the image to watch the video. In “Spatial Bodies,” and earlier videos like “Plasticity Unfolding” and “Impermanence Trajectory,” Larsson explores the tension between geometrical order and mechanical disorder, a tension that permeates natural and human-made structures alike. What is unusual is how Larsson neither loses sight of nor fixates on the potential of either the generative or destructive tendency to run amok. Instead he plays with the perspective of the structural drive itself, always vibrating against its own edges, demanding new form. The effect is one of tenuous harmony, both unsettling and serene. Under Larsson’s steadily ephemeral lens, a ‘spatial body’ is not the result of stagnation, but essential refinement. His oeuvre includes externalized and internalized, projected and abstracted structures, all undergoing processes of deliberate transformation. And when we follow Larsson into his precise renderings of these untamed calcifications, we find ourselves in a palimpsest of complex transparencies, like a split crystal, which appears at times to threaten, or promise, to absorb us. What follows is an email correspondence between Larsson and myself in which we explore some of the relationships at play in his work, from virtual reality, cognitive science, and environmental sustainability to sacredness, politics, and the subversive language of internet art. SG: You’re inspired by processes that occur naturally in the world but you tend to depict these processes in inanimate or unnatural bodies, such as buildings, rocks, or technology. Why is that? SL: When I depict ‘unnatural bodies’ undergoing ‘natural processes,’ I am playing around with the concept of technological animism in various forms, characteristics, and outputs. The idea of an intelligent computational universe in which each atom possesses a vast computational capacity is a fundamental aspect of my expressions – that all matter has the potential to evolve into some higher level of consciousness by adapting Artificial Intelligence, self-improving, and perhaps transcending beyond all possible recognition. By perceiving a computer, for example, as a living organism, I encounter many perspectives that I would normally not reflect upon. SG: I like the idea that everything that exists is natural. I often think of the “synthetic” world as an extension of the faculties – cameras as extensions of eyes, cars as extensions of legs, walls as extensions of skin. How does the human body factor into your work? SL: I suppose you could describe everything manmade as an extension of the body. It started with the most necessary refinement, such as simple tools. But technology is now at a state where it is so complex and confusing that it’s hard to distinguish what single biological part it might be derived from. I am thinking of how social media has become an extension of the body and mind, and how people are struggling to adapt and adjust to this form, which is yet not very defined. Social media is an increasingly consensus-structured open source, constantly shifting the bodies and minds of users according to algorithms based on our input, as well as corporate and government interests. I also think our “synthetic” experiences with virtual reality, mixed reality, and augmented reality will soon redefine the body and mind and the way we interact. Haptic technology, which has been around for awhile in simulators and video games, will soon evolve very quickly into devices we couldn't have imagined a few years ago, or would have found ridiculous and unnecessary. To make the digital environment feel more natural, it is necessary to create tools that integrate us with this virtual world. Much of my work concerns this process of integration. SG: Why should we integrate ourselves with the virtual or synthetic world? SL: Virtual reality opens up so many possibilities in all kind of fields aside from entertainment, like science, medicine, architecture, art and design, and especially education. People will be able gain new experiences, conquer phobias and restraints, learn new tasks, and comprehend their lives much better. I've been very interested in VR since the early ‘90s when it first emerged but never had the opportunity to test it until recently when Oculus Rift released their Development Kit 2. I'm now using their CV1 version on a daily basis and I reckon it’s the most fantastic technical gadget ever. I've been having perceptible experiences that are hard to distinguish from what we perceive as the “real world.” It almost feels as you're in a dream, and it has improved my lucid dreaming quite a lot. VR development has been extremely rapid the last couple of years, so it’s just a matter of time before we have perfectly accurate tracking, high resolution frames, super realistic graphics, and advanced haptic tools capable of transferring you to a convincing sub-reality. There are a lot of flip sides to it, obviously. But I think compared to sitting in front of a regular frame every day, as so many people already do, VR can actually render something that might be useful IRL. SG: Most of your videos are deeply rooted in cognitive science and biology, aren’t they? SL: Yes, especially a video trilogy I started a few years ago called “Impermanence Trajectory,” which deals with various aspects of the biological versus the synthetic body. In the first video, “The Limbic Nest,” I was intrigued by the limbic system and the sentiments it generates, and how it could be expanded by using quantum computation (a multifaceted form of AI) to create and evolve new emotions, resulting in a more complex and vivid realm of sentiments. The ability to build vaster and more complex neural pathways would not only expand our intelligence, but also our consciousness and feelings. In the video, a person’s mind follows a trajectory to various hubs that represents parts of the limbic system–for example, in the amygdala there are structures that symbolize fear and anxiety, while in the septal nuclei there are elements of pleasure and stimulation–only the limbic system is constructed inside a rock at a Shinto shrine in Ishiyama Dera, Japan that is considered sacred. CaptionStefan Larsson. Spatial Bodies (2016); video still. SG: I saw “Spatial Bodies” as an externalization of some of the ideas you were working with in “Impermanence Trajectory.” In “Spatial Bodies,” we floated outside the animated city. Although I suppose the idea of sacredness might make the rock a very different kind of material. Can you elaborate on the relationship between sacredness, quantum computation, and animism? SL: If we consider the process of computation, going from simple mathematical tasks, into Turing’s era, Marvin Minsky, neural networks, narrow AI, deep learning, and into the future of quantum-based computers and versatile AI entities, we can see how a something as static as a rock could transform into a dynamic body of possible consciousness. We can then consider evolution as a process that first ran parallel with humans, but will eventually become so powerful that it will be hard for us to apprehend what it actually is and how to handle it. When computers possess intelligence equal to all human beings that have ever lived on earth and are constantly multiplying their capacity, another form of nature will be revealed in which matter can be bent into all sort of structures, living or static. You could call it technological animism– the way nature uses human intervention to refine itself. Lately Nick Boström’s theory about a computer-simulated world has gained much attention. Considering the idea that we will live in copy of a copy of a copy, etc., of a simulated world, it is interesting to speculate what sacredness is as a phenomenon. Perhaps humans can't comprehend everything, and occasionally label “divine” or “sacred” what are just some glitches or errors in the code. SG: Sacredness as a type of glitch in the code–I love that. You went to art school before a lot of these technological devices and theories were around. Did you ever think you would become a more classical artist– painting, drawing, sculpting, etc.? SL: Yes, I started with oil painting, trying to learn the basics, and for a while I thought I should continue with that. This was in the early to mid ‘90s and I couldn't really relate to the conventional art scene, especially in Sweden where I lived. On the other hand, I was very inspired by the vital music video scene that time with directors such as Spike Jonze, Jonathan Glazer and Michel Gondry. I think that if I had started about a decade earlier before video and CGI Technic became cheap and accessible, I probably would’ve been into painting, installations and sculpting. SG: What brought you from Sweden to Japan and how did the cultural shift affect your work? SL: Since I was in my teens, Japan always felt like the most fascinating country to me. I had this naive vision that once I got there everything would connect. There seemed to be so much inspirational stuff that would unfold a path that I wouldn't lose my grip on. I’ve now been living here for eight years and it somehow seems true. I started this art concept called AUJIK a couple of years before I moved to Japan– I couldn't really find a direction prior to that. I had the core ideas, but it wasn't until I started discovering the Japanese forest, mountains and shrines that I knew how to execute them. I became a lot more productive than I would have if I had lived anywhere else. One aspect of this that might be a bit negative is that I've recently realized I've to some extent been trapped on the same aesthetic track. This latest video “Spatial Bodies” was an attempt to liberate me a bit from that and find new horizons. SG: I'm curious to hear more about the roots of the AUJIK concept. SL: I decided at quite an early stage that I should work with concepts, or labels/brands, as a platform instead of using my real name, which makes it more personal and rigid. I started with a sort of subversive political concept called QNQ, short for Conquistador, through which I attempted to express the horrible aspects of a post-colonized, media-crazed world. I wanted to use the structure of a brand as a capsule, manufacture some products, presumably clothes and accessories, and then charge it with whatever content I would like to express. AUJIK started as a branch of QNQ. At first I wanted to focus on it as a tech-cult that built artifacts that were hybrids of machines and organic elements. These artifacts would have a conscious mind that they used for contemplation and spiritual practice. You could characterize the early iterations of these artifacts as religious-synchronistic with some apocalyptic tendencies, but then I headed towards animism and a more laid back approach. I figured the only way I could execute these ideas was to use computer graphics. I had no skills or experience in that so I started learning it and dropped everything else. The first videos simply presented AUJIK's artifacts. I then got into motion tracking and integrated these artifacts into real environments. When I became more comfortable with this method, I started focusing more on topics related to Artificial Intelligence, trying to achieve a more holistic world of AUJIK and its elements of AI, nature, and consciousness. SG: Your videos got me thinking about the environmental crisis and the lack of media attention it gets in comparison to more sensationalized ideological issues, which are presented as more "human." To what degree does AUJIK's concern with nature stem from that subversive political aspect of QNQ? SL: On a personal level, this is an issue that bothers me more than anything else. There's still hope to avoid the complete devastation of this planet, but it all seems to be the decision of politicians and major corporations, and most of the people in these positions are still thinking in monetary terms and won't bother with a sustainable agenda to reduce carbon dioxide and repress global warming. The current lack of concern by most world leaders, focusing on their "human interventions" while approaching the brink of a nuclear world war, gives me the chills. What's even more eerie is that the majority of people have this, "What, me, worry?" attitude towards it. But I guess that's always been a more or less natural reaction when facing an "inevitable" disaster. I used to think that humans were primary and Earth was somehow disposable and that we eventually would find another place to inhabit. That perspective flipped a long time ago, realizing how unique and precious our planet is and how unrealistic it is to reach another inhabitable world—except traveling by wormholes, or sending AI. Earth and nature are all that matters, and hopefully technology will be able to advance enough in a positive direction to help sustain this world. It's all about discovering and using the most sufficient energy resources. “Spatial Bodies” was an attempt to start a new line in which I'm able to present more common and general topics focusing on the current earth crisis. That video doesn't really resonate with AUJIK's concept, compared to previous work, so I've been considering starting another label just to manifest these reflections. AUJIK been sort of an obscure and introverted project, so I'm also feeling the urge to make something more explicit.